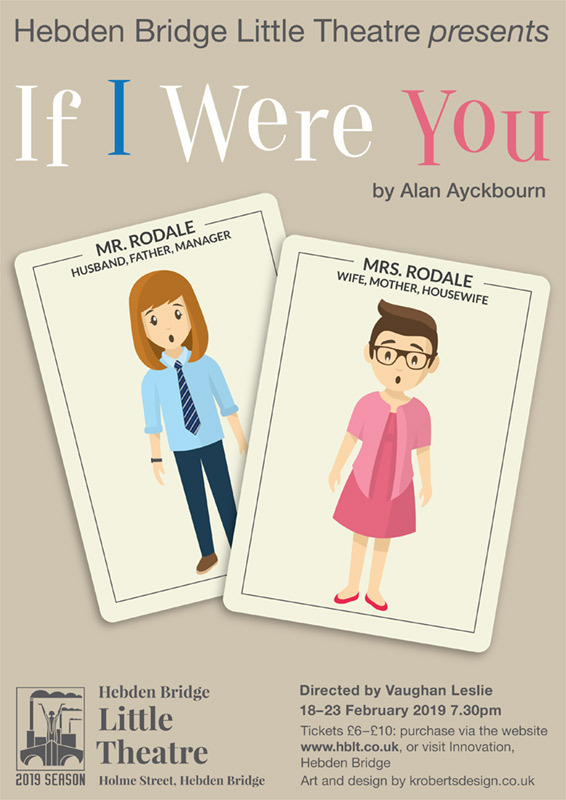 We will be auditioning for the first play of the new season, If I Were You, by Alan Ayckbourn, at 7.30pm on Wednesday, 7 November, in the Little Theatre bar. Mal and Jill’s family life is beset with problems. Mal is having an affair, and doesn’t realise his wife knows about it. His son-in-law Dean can do no wrong in his eyes, but Mal’s cherished daughter, Chrissie, has some unexplained bruises. Mal has also fallen out with his 15 year-old son, Sam, and they are not speaking. Waking the next morning, the couple find they have inexplicably switched bodies! Now each has a chance to see things through the other’s eyes, with hilarious and life-changing consequences! We are looking for a cast of five, to play Mal and Jill who are in their forties, Dean and Chrissie, in their twenties, and Sam, aged 15. The play is directed by Vaughan Leslie, runs from 18-23 February, and rehearsals will commence in earnest in the New Year. Contact: Vaughan Leslie (vaughanleslie@hotmail.com; 07415 062810; 01422 845446).